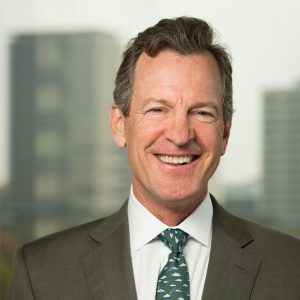 HOUSTON – (By Michelle Leigh Smith for Realty News Report) – The City of Houston, as it prepares to spend billions and make important decisions regarding flood management, is at a critical point in its history, says Tom Bacon, co-founding partner of Lionstone Investments of Houston. The future of Houston is horizontal, not vertical, Bacon said. “It’s about the ground plain, the public realm,” he says. He shared his vision, grounded in his belief that now is Houston’s time to shine, with an audience at CREW, a network for the advancement of women in commercial real estate at a Junior League luncheon. “Cities are more untethered from the state and federal government. That’s part of the reason it is up to us to drive that progress. We have to collaborate,” Bacon said. “We’ve got better tools now – the Harris County Flood Control District is the best in the world at what they do, and if they just weren’t called Flood Control, we’d be at peace. “ He thinks Flood Management would be a better name. He opened his remarks with a guiding premise reflected a belief that we are in a stage where we have to rethink what we are doing in order for the transformational moment to move ahead. “I’ve been sitting in the room with real estate people for 35 years,” said Bacon, who has served on the Kinder Institute for Urban Research’s Advisory Board since 2017. “There aren’t enough women in the room.” He attributed his success to three strong women – a mother who went to law school at age 42, his wife Laura and his daughter, Katie. He began his career as a commercial architect with Hines, “back when we used to draw buildings with a T-square.” He held positions leading domestic development and also development in Latin America. Bacon endorsed the Bayou Greenways 2020 plan for a city of walkable villages connected by exceptional greenspaces and quality multi-modalities, where opportunity is woven into a city fabric for everyone.